The tale of woe for traditional retailers continues. Macy's, Kohl's and Dillard's all reported lower sales for the last three months and missed Wall Street's forecasts. Department store chains have been struggling lately due to intense competition from Amazon, a resurgent Walmart and newer retailers like Uniqlo, H&M and Zara. 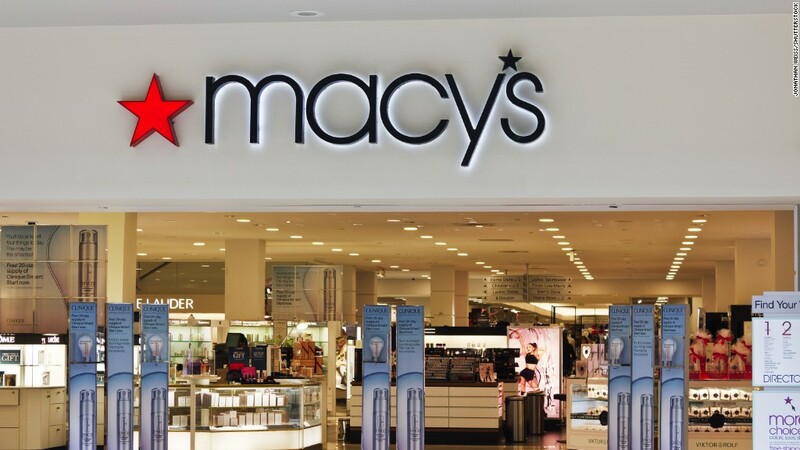 New Macy's CEO Jeff Gennette, who recently took over from long-time Macy's chief Terry Lundgren, said in its earnings release that the company was encouraged by the sales of women's shoes, jewelry and furniture in its stores. But overall sales fell 7.5% from a year ago and same-store sales, which measure how well stores open at least a year are doing, dropped more than 5%. Gennette conceded there is a lot of work to do in order to boost the company's overall performance, particularly with regards to its e-commerce offerings. "We are focused on taking actions to stabilize our brick and mortar business," Gennette said. "At the same time, we will invest to aggressively grow our digital and mobile business." Investors weren't impressed. Macy's (M) stock deflated faster than a balloon at the end of the company's trademark Thanksgiving Day parade in New York City Thursday morning, plunging nearly 15%. Shares of Dillard's (DDS) fell 13% and Nordstrom (JWN), which will report its earnings after the closing bell Thursday., fell 7%. Kohl's (KSS) fell about 6%. One possible reason why Kohl's didn't drop as much as Macy's? It did report a profit that topped analysts' estimates at least. Macy's did not. But investors remain focused on the weak sales trends for these and other traditional retailers. Dillard's CEO William T. Dillard, II noted in the earnings release that "our sales decline weighed heavily" on its overall results. Total sales were down 6% from a year ago while same-stores sales fell 4%. Kohl's CEO Kevin Mansell took a more upbeat tone though, saying he was "encouraged by the significant improvement in sales and traffic" after a tough February. But it still wasn't enough to keep overall sales and same-store sales from falling about 3%. These three retail icons aren't the only ones that have been hit hard by a rapid change in how consumers shop. Sears (SHLD) continues to struggle. And JCPenney (JCP), which will report its latest results Friday morning, has been unable to find a way to get sales growing either. Target (TGT) has been hit hard as well. And former teen fashion king Abercrombie & Fitch (ANF) is now looking for someone to buy it. But some retailers have suffered an even worse fate. American Apparel, Wet Seal, The Sports Authority and Aeropostale have all filed for bankruptcy. RadioShack has gone bankrupt -- twice. All of this turmoil has led to tens of thousands of layoffs in the retail sector as well. Meanwhile, Amazon (AMZN) has reliably wowed Wall Street with its strong sales and profits. And Walmart (WMT) has been on a shopping spree lately, scooping up Jet.com and several other online retailers in order to boost its own digital commerce offerings.